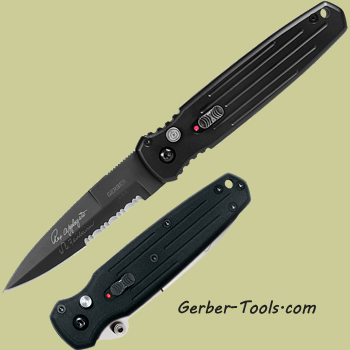 Gerber Covert Auto - Serrated 30-000137. Covert Operation or just daily life- this one was made for your Mission. Designed by Rex Applegate and W.E. Fairbairn- their signatures are on the front on the blade. This automatic knife is ready to deploy with one push of a button. Sharp spear-like pointed edge is ready for piercing and it is a half serrated blade that is 3.78 inches long and made with S30V steel and black oxide coating. The handle is made of Type III Anodized 6061 Aluminum, grooved lines help to keep a secure grip. Lanyard hole on the back and black pocket clip in the tip up position for right handers. Overall length is 8.70 inches. Proudly made in the USA. Covet your Covert- others will seek to capture this baby!